Today we have a special guest blogger – Peter Galbert, who will be teaching a week-long Windsor chair building class this October. 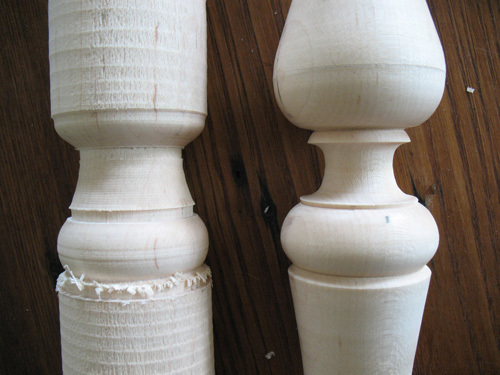 Peter shares some of his techniques for turning the shapes that make up the balusters in the article and video below. If you found this as fascinating as we did, you ought to consider signing up for his class this October! Enjoy the tips below from a true master. When I started turning parts for chairs, the first hurdles that I faced were creating the shapes that made up the balusters. The bead and the cove are the basic elements, and learning to make them is challenging. I spent countless hours making rows of useless bead and rows of useless coves. Why not just turn the whole leg?? Well, I found out quickly that trying to turn out a leg was an act of futility and frustration, plus, it seemed like I never got any better! Turning a whole leg before mastering (I use the term loosely!) the individual elements is like trying to play a symphony before learning to play the individual notes: sure, on occasion you might hit the right one, but good luck repeating it! One of the benefits of creating practice shapes, besides not tensing up for fear of wrecking an actual chair part, is that you can see your problem areas quickly. When making a row of beads, I make one side of the bead all the way down the line, then I turn the other side on the way back. This also helps to highlight the problem areas. Once again, fussing around with one perfect bead won’t teach nearly as much as repeating a move over and over down the line. Even if you are left with a row of rather poor shapes, you are getting the feel for the motion. This familiarity and comfort with the motion becomes the key to making consistent turnings. The biggest hurdle to overcome, after mastering the separate shapes, is making them in the right spot and the right size in the design. This sounds easier than it is. I found that the key here is to make the shapes in the same order, move for move, each time that I turn a leg. Each turner will of course come up with an order for locating and making the shapes that works with their turning technique. Here is a video that describes how I create (and practice) the most complex portion of the baluster turning. In the video, I will make three practice areas to different levels of completion. As you watch, you’ll see how soon you are able to anticipate which move comes next. To me, eliminating the question “What comes next?” is a vital part of making consistent turnings, it should become as natural and familiar as driving to the store to get a quart of milk. Any misstep or problem area will become apparent instantly. Good luck and happy turning!